The size and weight of electronic and electrical equipment has drastically reduced over the years, requiring smaller and smaller high voltage interconnections in such professional equipment and devices. Corona is an ion/electron partial discharge under high electric fields, and is an inevitable consequence of conductor diameter reduction. The reduced life of insulating materials under corona imposes limitations on miniaturisation and choice of materials. Conventional HV cables of large sizes, when bent sharply, are even more prone to corona stress (at bend points) and early failure. CR PTFE provides the answer for such applications. PTFE HVCR cables are NOT CORONA FREE, but are designed for 10,000 - hour life under corona (shielding will help to reduce corona effects on nearby circuits). The HVCR cables are a significant advancement in technology and are recommended for "potentially" high risk applications. These cables offer assured reliability, long life at high temperatures and voltages with significantly smaller diameters and weights. All the advantages of PTFE (except RF properties) are retained in CR PTFE: chemical inertness, Thermal/Physical/Electro-mechanical properties from cryogenic to 260°C, and non-flammability. 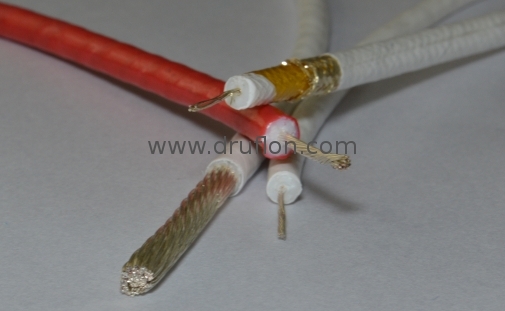 Additionally, these CR cables are free from ageing, tracking and mechanical stress-cracking failures. These designs permit much higher CW and even higher Peak/Impulse power rating. Aero-Engines, Rockets, Racing Car Engines. Copyright © 2002-2019 Druflon Electronics P. Ltd. & Druflon International. All rights reserved.